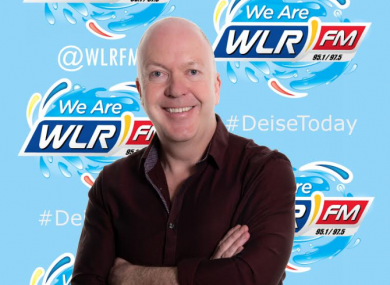 Damien Tiernan now hosts Deise Today on WLR FM. FORMER SOUTH-EAST correspondent Damien Tiernan has hit out at RTÉ station bosses for its regional coverage and says he is “disgusted” by their reaction to his criticism. Tiernan left the national broadcaster after 23 years last month and is now host of Déise Today on Waterford radio station WLR FM. In an interview with the Sunday Business Post published today, Tiernan voiced a number of criticisms of RTÉ, both in terms of its news coverage and cost-cutting efforts. Tiernan said during the interview that RTÉ’s Waterford studio produced an average of 220 TV radio stories a year in the early 2000s but that this has been cut to between 50-60. Tiernan added that other local RTÉ local correspondents are also “constantly trying to get stories on air”. In response to the interview, managing director of RTÉ News Jon Williams tweeted that the station has recently invested in local reporting. RTÉ had also told The Sunday Business Post that they did not accept Tiernan’s figures on the output from Waterford. Responding to Williams in a series of tweets, Tiernan said that RTÉ were accusing him of lying by not accepting his figures. Am disgusted, disappointed but not surprised by RTÉ basically calling me a liar with my figures Jon; RTE does not recognise my figures because RTE doesn’t care enough to ask someone to count them. And you were forced re reappoint NE Corr by unions after ye tried to downgrade role. “And one thing, the Regional section on the website and app is a joke,” he added. Tiernan announced he was leaving RTÉ on New Year’s Day last month in which he gave scant details of his sudden departure. I have been with the organisation 23 years. Thank you to everyone with whom I have worked, especially my colleagues in the South East. I will be finishing the end of next week. Email “'Bring it on' - Former RTÉ reporter Damien Tiernan hits out at Montrose bosses over regional coverage”. Feedback on “'Bring it on' - Former RTÉ reporter Damien Tiernan hits out at Montrose bosses over regional coverage”.